Crafted in lustrous 14ct polished white gold, this exquisitely crafted third carat diamond twist ring from Ever Us features two sparkling claw set diamonds at its centrepiece. Glittering diamond set shoulders add even more luxury to this beautiful piece of jewellery. 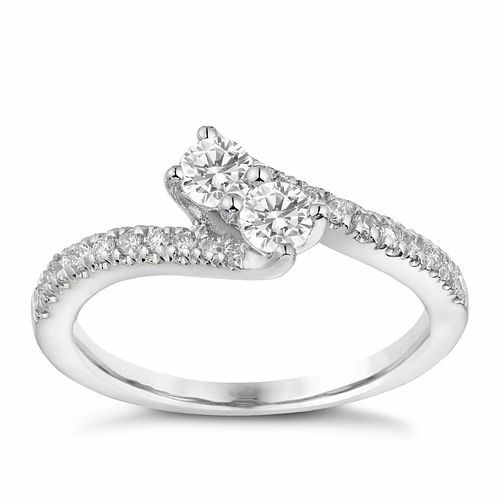 Ever Us 14ct White Gold 1/3 Carat Diamond Twist Ring is rated 5.0 out of 5 by 1. Rated 5 out of 5 by Anonymous from My Fiance absolutely loved the ring My Girlfriend, and now fiancée absolutely loved the ring and constantly gets very good comments from anyone that she shows it to. Therefore I would recommend this ring.